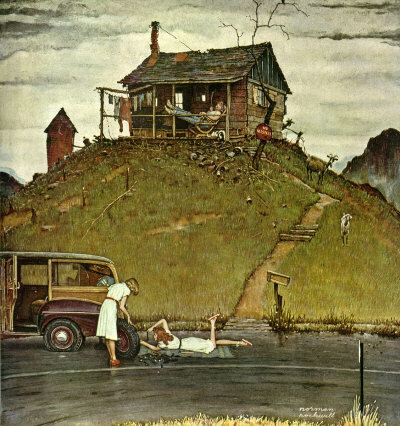 Fixing A Flat, a Norman Rockwell painting, appeared on the cover of The Saturday Evening Post published August 3, 1946. This is another favorite of Rockwell collectors, a classic enduring image of the world Rockwell painted. An alternate title for this painting is Changing a Flat. This painting was Rockwell's 240th overall out of 322 total paintings that were published on the cover of the Saturday Evening Post. Rockwell's career with the Post spanned 47 years, from his first cover illustration, Boy With Baby Carriage in 1916 to his last, Portrait of John F. Kennedy, in 1963. This was also the fourth cover for The Post in 1946. In 1946, there were seven Norman Rockwell Saturday Evening Post covers published. Several studies also appear in the Norman Rockwell Catalogue on pages 168, 169 and 170. In this painting, Norman Rockwell shows us how not to be a gentleman. The central idea of this painting is that these two young ladies are in distress. They have a flat tire. They aren't really in distress, because they are changing the tire. Remember that this takes place in an age before the first mobile phone. No help can be called, as there is no phone in the cabin on the hill either. The occupant of the cabin is watching the two young ladies doing their work. He seems relaxed. His abode looks like he has been relaxed for some period of time. There is a hole in the roof, The chimney looks like it is falling in. The mailbox on its post by the road looks like it may fall off at any time with a strong breeze. His goats have the run of the place. He is not getting out of his chair to offer any assistance. In fact, this flat tire may be the most excitement for him in some time. Fixing A Flat was only one of 322 Norman Rockwell Saturday Evening Post covers; Here is the list of Norman Rockwell Saturday Evening Post cover illustrations. Thankfully, these girls know how to change the tire. Let's hope they finish before it rains. The model for the young lady changing the tire is Patty Schaeffer, daughter of fellow Post cover artist, Mead Schaeffer. Patty also modeled for some of the paintings in the Willie Gillis series of paintings earlier in the decade in addition to Fixing a Flat. Do You Have A Great Story, Opinion Or Contribution About Fixing a Flat?